Regular visits to the dentist are important to detect potential dental problems that you might be experiencing, and certain diagnostic tools can be helpful during this process. At Your Downtown Dentistry, we use digital dental x-rays to provide high quality treatments and diagnostics to every patient that visits our office. During your dental exam, Dr. Behzadi and other members of our experienced team will do a visual inspection of your teeth and gums. But, it is difficult to get a complete picture about your overall dental health without seeing details that are going on under the surface. The outside of your teeth might look fine, but certain types of disease and damage can’t be seen unless additional diagnostic tools are used. Digital dental x-rays are often used during regular dental examinations, as well as any other situations where additional information is needed about your dental health. It is more efficient to use digital x-rays instead of the old format of film prints, because the images can be pulled up on a computer screen and used in a number of different ways. Dental x-rays use low levels of radiation, but they are safe. They provide important information to the dentist, such as identifying new cavities, evaluating the health of your gums, and looking at the growth of teeth. The frequency of digital x-rays depends on your health, age, and risk for dental disease. Your dentist will help by evaluating your individual situation to make recommendations about how often you should have x-rays. It is common for a dentist to take digital x-rays during the first visit with a new patient, and then additional x-rays will be taken on a periodic basis during checkups and examinations. Because low levels of radiation are used for the x-rays, it is important that you tell the dental staff if you are pregnant or have any other health conditions that might be impacted by the radiation. When the x-rays at taken, a leaded apron is used to protect your body from the radiation in order to minimize exposure. 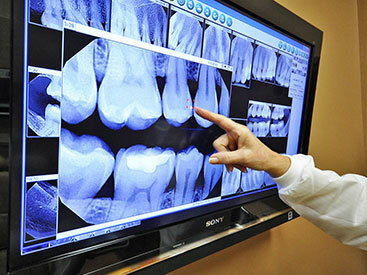 Overall, dental x-rays are very beneficial because of the information that is available to the dental staff. By using this advanced diagnostic tool, it is possible to identify potential dental health problems during the early stages, so that the treatments can be done before bigger problems develop in the future. If you have questions about x-rays or any of the other diagnostic methods that we use, we invite you to contact us anytime. For more information on Digital X-rays in the Orlando, FL area call Dr. Ali Behzadi at (407) 502-0202 today! Nitrous oxide or commonly called “Laughing Gas”, is available during all of our restorative treatment procedures. Small doses of nitrous oxide help most patients feel relaxed during their care, and some even giggle a bit. Nitrous oxide works quickly and reverses just as soon, so that you will feel like yourself again within 5 minutes of the treatment being completed. 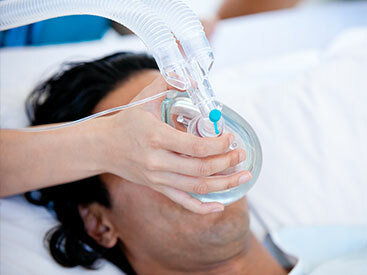 For more information on Nitrous Oxide Sedation in the Orlando, FL area call Dr. Ali Behzadi at (407) 502-0202 today! At Dr. Behzadi’s office, he provides his patients the most advanced state-of-the-art dental technology in Orlando. Our staff is committed to superior quality of care using the best technology available. Dr. Behzadi has been using the Wand™ at his office for years and can’t imagine his practice without it. No more painful injections in dentistry! 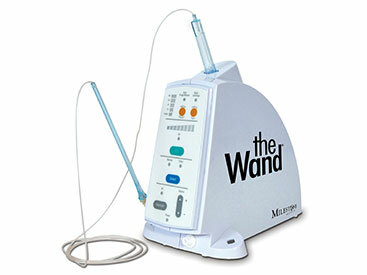 The Wand™ is a digital anesthetic instrument which places the numbing solution slower than humanly possible. Most patients comment that it is the most comfortable anesthetic they have ever received. With it being a pain free dental anesthesia, patients quickly overcome their nervousness. Whether injections make you nervous or not, The Wand™ helps to provide a more effective anesthetic delivery. No more painful injections and you’re more comfortable throughout your entire procedure. The Wand™ is an excellent example of Dr. Behzadi’s efforts to bring you the latest state-of-the-art dental technology and to help all patients have a pleasant, pain-free dental experience every time you visit. For more information on Painless Injections in the Orlando, FL area call Dr. Ali Behzadi at (407) 502-0202 today!